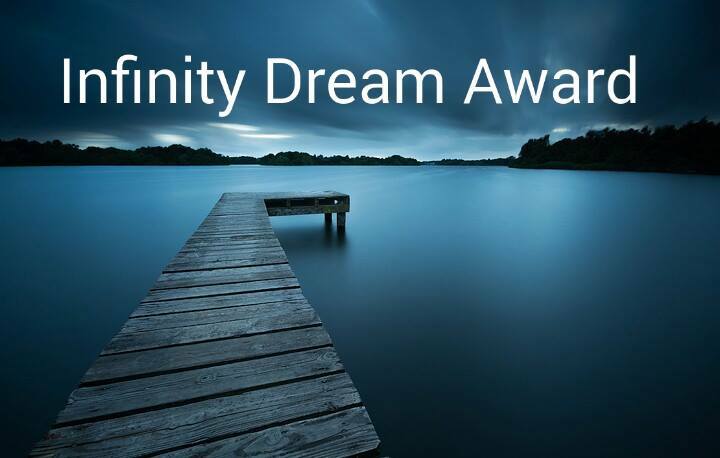 I have been nominated to The Infinity Dream Award by Soso, a French blogger I have followed and appreciated for quite a while now. In Un pied ici, un pied là-bas she writes mostly about her extensive travels, but just as importantly, she also introduces us to some of Paris’ little gems, Paris being her home at this time. The award comes with some rules, and as I am not terribly fond of rules I would normally have given the invitation a pass; however, as I dislike passing on a challenge just as much, I will play the game. For it is just a game, not unlike the very well known Questionnaire de Proust which is often played and quoted to this day. Is this revealing of one’s personality, most likely, but as they would say in French, le jeu en vaut la chandelle. Now, here are the rules of the game as they were passed on to me. The commentaries are of course mine. Answer the questions that were set for you. Nominate 11 bloggers and set 11 questions for them, then go to their blog and notify them. I am gladly retired and thoroughly enjoy the freedom to live mostly as I please. I enjoy playing golf, practicing, however, is an entirely different story. My handicap is a highly secretive affair. I love writing but lack the discipline necessary to be at work everyday. I practice and teach Japanese flower arranging and delight in the use of negative space. I am an avid reader and have a weakness for a good mystery or suspense novel. On T.V. I enjoy Masterpiece Theater. Lately we have been watching Miss Fisher Murder Mysteries, an excellent Australian series available on Netflix. I can never pass on a movie that has Paris in its title or settings. Between my wife and I, we have 7 children and 14 grandchildren. When traveling I greatly enjoy unexpected discoveries and utterly dislike going down the street guidebook in hand. That being said, we have had some delightful moments from guidebook recommendations as well as with tour guides. I am not always the ideal travel companion. We are not quite out of the bushes just yet. You might think that I have confessed quite enough, but I still have to answer those questions provided by Soso, therefore here we go. How do you start your Sunday morning? I would love to say with coffee in bed but that would be a lie, furthermore, I don’t even drink coffee. I know, I know, some would consider that a sin. I do enoy a great cup of tea. Truth be told, no two Sundays are alike. I will go to church when I am attracted to the topic offered, or for sure when the choir is singing as I am part of it. Such a lovely baritone voice… (;-). The service is usually followed by brunch with friends. But there are times when Sunday is a golf day. One can always meditate on the green. What’s your favorite reading(s) of the last six months? I have read lots of mysteries by authors like Louise Penny, Donna Leon, and Val McDermid. Of late, I have been somewhat into soul searching, trying to balance who I am with where I’m at. Big words I know. Two authors have pushed me in that direction. The first one is Richard Wagamese, and I have to admit I was hooked as soon as I had read Ragged Company (see Richard’s page for details on his books). This was certainly a tough read, but there is no way one can put that book down. One might not identify with any of his characters, but one can’t help but feel for them while questioning oneself. Powerful book, we all have a story, we are the story, I have learned that much from that book as well as from Keeper’n Me, and For Joshua, both by the same author. The second author I mentioned is Cathryn Wellner, and her book Feisty Aging has encouraged me to review my own aging and compare it to the many characters portrayed in her book, a very valuable exercise. What’s the kind of attitude you hate the most when travelling in public transportation? The lack of consideration given others by certain passengers who will push people around, take seats reserved for those in need, speak loudly etc. Who changes the toilet paper roll at home? Whoever needs paper at the time. How many (really) good friends do you have around? (be honest!) As you might expect, they are not legions. After reading Feisty Aging I did give the subject some consideration. When I was in boarding school, for 5 years of my life, I had one good friend. In graduate school, one good friend again. During my teaching career, one good friend. Today, in retirement, half a dozen good friends. I’m still working on this. If you could relocate right now, which would be the city or country of your choice? I would like somewhere warmer, safe and affordable. Any suggestions? “I quit my job” or “I fired my boss… Which personality are you? Tough one. Over the years I banged lots of doors behind me. In the end, I chose early retirement. What could make you want to stop blogging? Nothing really. I only have 68 followers, including myself (I don’t know how I managed that one), but truly, I would do it just for me, as a personal journal. But who am I kidding? The more the merrier. Oops! There were only ten questions. What is the most interesting place you have ever lived in or visited? In that same vein, which is the most challenging place? What does a good day look like to you? If cost and travel time were not an issue, where would you want to spend a weekend? 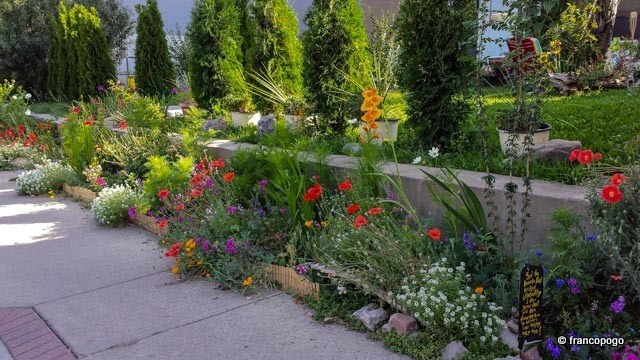 What would you plant in a garden of your dreams? What inspirational quote speaks to you today? Tell us about a random act of kindness you have given or received. What authors would currently be on your top 3 to 10 list? 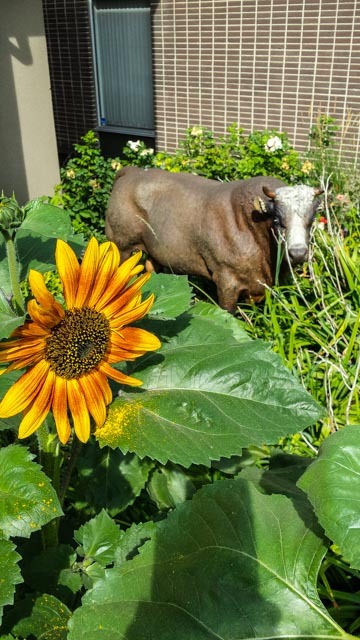 Sculpture in front of Udell Gallery, Edmonton AB. The Summer holidays have come and gone and we had an enjoyable time travelling to Creston, British Columbia, to visit with family and friends. We had our granddaughter Ella along for the ride as part of her 11th birthday celebration which is an event often carried over a couple of weeks. At times, some family birthdays were celebrated over a whole month, just ask our grandson Mylan. Enough digression. I had hoped to write earlier about our flower arrangements, but weeks went by without any being done. We were to attend an ikebana workshop in Saskatoon at the end of July, unfortunately, the event was cancelled at the last minute. Not to despair, we had been invited to do a demonstration during Animethon 22 which took place this past weekend. 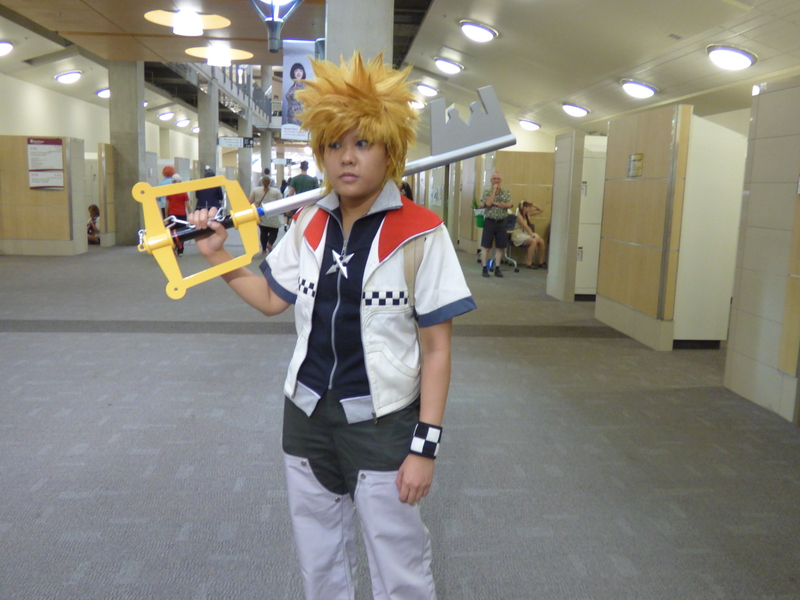 During this festival, thousands of young people come to Edmonton to celebrate the popular arts of Japan, most notably, the anime, and many come dressed as their favorite character. Yesterday, August 9th was the last day of the event, and for the second year, we offered a demonstration of ikebana. 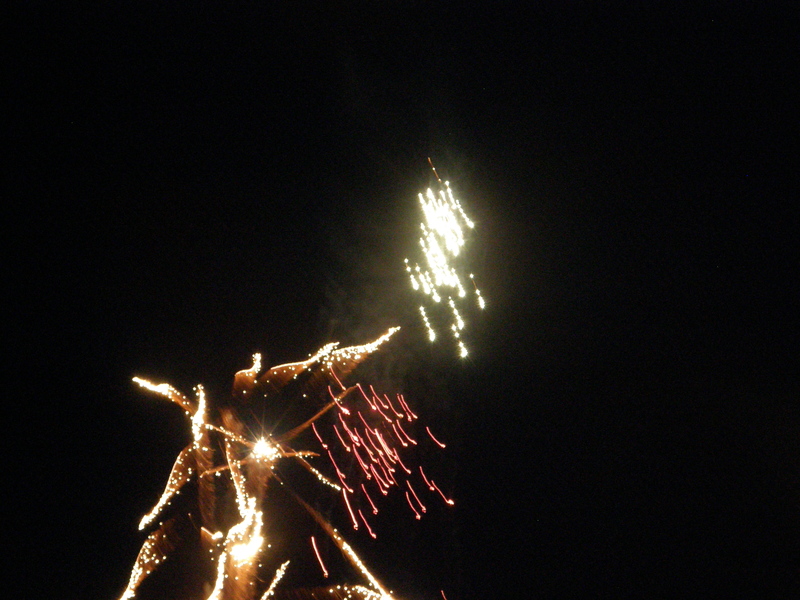 The free style above was one of the arrangements done for the occasion. 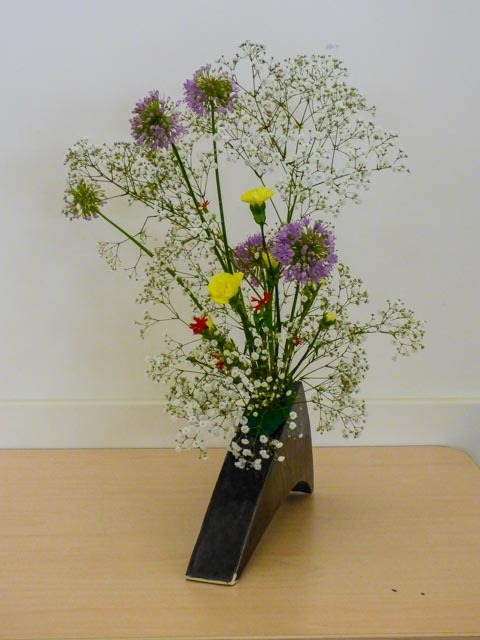 Other arrangements have been posted on our EJCA Ikebana Club website. To have a clearer picture of that event, please visit our contribution to Animethon 2014. The two arrangements above were contributed by visiting professors from Japan who, along with the Headmaster Sen’ei Ikenobo, honoured the attendees by their presence, their arrangements and their teaching, which will be the subject of another post. I wanted to offer an extensive coverage of the exhibition but, unfortunately, my photography was not good enough and, therefore, what follows is a mere selection of what was on exhibit. On this occasion, I did miss my official photographer.